With our ROYAL CANIN® Loyalty Programme you can gain points for buying your ROYAL CANIN® pet food. When you’ve got enough points you can treat yourself to money off your next purchase. Receive 400 free introductory points worth £4 / €4 straightaway when you register your account. Subscribe to our personalised newsletters to receive pet care advice. Spending your points is simple. Points are accrued at 4 to every £1 / €1 you spend in your loyalty store (we are sorry but this does not apply to internet shops or chains such as Pets at Home). Points are redeemed at 1 point to each 1 penny spent. So if you have 100 points that means you have £1.00 to spend. Vouchers are available in denominations of £3 (300 points), £5 (500 points), £10 (1000 points), £15 (1500 points), £20 (2000 points) and £30 (3000 points). You can claim vouchers to spend at your Loyalty retailer, you can either do this online via a voucher download which is sent directly to you by email when you are logged into your account, or you can ask the retailer to deduct the points from your account in store at the point of the transaction. Vouchers carry a 12 month expiry date. Step 1: Collect your free loyalty card from a Loyalty stockist. Look out for the symbol on our stockist finder. You can also download a digital version of your loyalty card from our Loyalty Card partner Stocard. 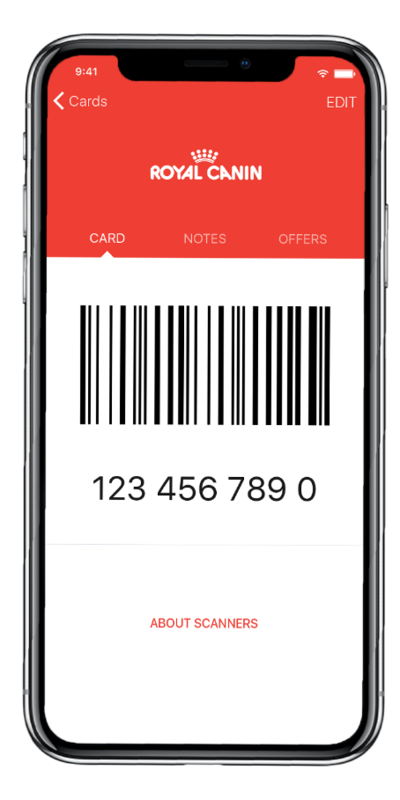 Simply download the Stocard app on Google Play or App Store, add your ROYAL CANIN® Loyalty card (by scanning your physical card or entering in your card number) and simply show it in store when you purchase or redeem your points.